We make beautiful crafts, our customers love us. 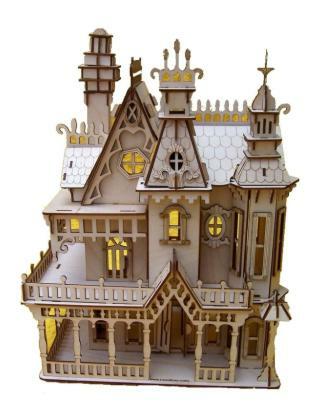 As a small company we need to get the word out, so we are going to host a contest for our elegant laser cut wood Victorian Doll House kit. 2) Pick one of our items you like and write about it. 3) Post a message to our comment thread that tells us your participating. At the end of October we will pick a winner randomly. Chemistry Scrabble Style laser cut and laser engraved pendants. School Bus photo frame for K-12 School Photos. 100 Custom laser engraved Popsicle Sticks for wedding. Custom paw print key chain. Wood Crayola Box for wedding ring. Sundial with anniversary lines, birthday lines, wedding lines. Custom wood memorial photo frame. Custom laser engraved rosettes for moulding work. Maybe I will get pictures posted. 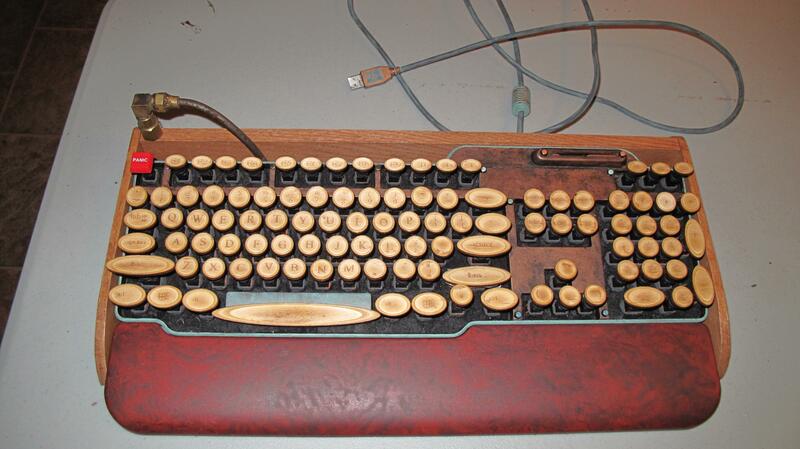 Customer supplied photos of a great steampunk keyboard made using our laser cut 3D keys. Excellent work, Jeff (the creator) has inspiration to make more. If you want a custom keyboard similar to this contact Jeff Frazier jefferysfrazier@gmail.com. BTW - Jeff is a Marine and just got back from Afghanistan, he will be returning and is on the road a lot. So if he doesn't respond immediately to your email, be patient. After seeing many vendors on Etsy selling faux (French for fake) typewriter keys I decided to make some real wood laser engraved ones. With sort of a Steampunk twist, including all English letters and many symbols, lots of Greek, Astrology, Math and Science as well. These keys are laser cut and engraved using the 3D laser print driver, and the results are amazing. A customer came to us several months ago asking for a special project, the background on the story goes like this. "Such and such has been making this item for me, for a long time, he's going to stop and focus on a commissioned project for a year. He put up a shop sign saying he is no longer accepting orders. I really need these items made because I package them with my product and could not possibly sell my signature items without his special made item included." We have been very busy with custom work, and our own creations. Since the last blog update, we have done several charity/donation projects. Spoken to a lot of potential customers. Had face to face meetings with customers. Had long-distance conversations via email, and phone with customers. Business is growing at a very steady pace; we still don't know what our niche is going to be. I can tell already it won't be Acrylic, the stuff smells real bad when lasering it. Leather smells real bad too, but it's not as caustic. Phoenix Laser Engraving has successfully taken the first 111 characters of the Chinese text version of "The Art of War" and precisely laser engraved each Chinese character into one mosaic glass tile. The glass mosaic tile is from Premium Glass Mosaics, each tile is 1x1", with a 0.2" gutter between each glass mosaic tile. Once the template was created in CorelDraw it was just a matter of time to center each character vertically across the 11x11 mosaic grid. RTFM - It's nice to learn about a feature in your software that will save time, and improve quality. Tonight after doing the eBay orders, and a bunch of dog tags, I started working a box of tile. Phoenix Laser Engraving likes to be unique and wow customers, first appearances make a huge difference. 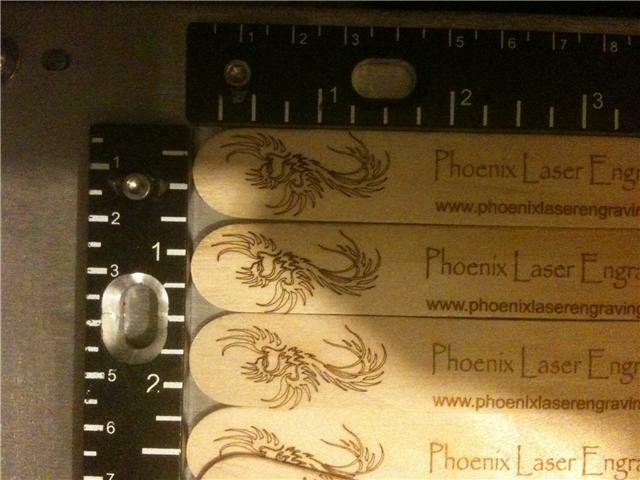 Instead of using standard business cards we created laser engraved popsicle sticks. Here is an image of our calling card.